The domain within your query sequence starts at position 1745 and ends at position 1788; the E-value for the FYRN domain shown below is 3.25e-19. is sometimes closely juxtaposed with the C-terminal region (FYRC), but sometimes is far distant. Unknown function, but occurs frequently in chromatin-associated proteins. The "FY-rich" domain N-terminal (FYRN) and "FY-rich" domain C-terminal (FYRC) sequence motifs are two poorly characterised phenylalanine/ tyrosine-rich regions of around 50 and 100 amino acids, respectively, that are found in a variety of chromatin-associated proteins [(PUBMED:9247308), (PUBMED:10838566), (PUBMED:11779830), (PUBMED:20506279)]. They are particularly common in histone H3K4 methyltransferases most notably in a family of proteins that includes human mixed lineage leukemia (MLL) and the Drosophila melanogaster protein trithorax. Both of these enzymes play a key role in the epigenetic regulation of gene expression during development, and the gene coding for MLL is frequently rearranged in infant and secondary therapy-related acute leukemias. They are also found in transforming growth factor beta regulator 1 (TBRG1), a growth inhibitory protein induced in cells undergoing arrest in response to DNA damage and transforming growth factor (TGF)-beta1. As TBRG1 has been shown to bind to both the tumor suppressor p14ARF and MDM2, a key regulator of p53, it is also known as nuclear interactor of ARF and MDM2 (NIAM). In most proteins, the FYRN and FYRC regions are closely juxtaposed, however, in MLL and its homologues they are far distant. To be fully active, MLL must be proteolytically processed by taspase1, which cleaves the protein between the FYRN and FYRC regions [(PUBMED:12482972)]. The N-terminal and C-terminal fragments remain associated after proteolysis apparently as a result of an interaction between the FYRN and FYRC regions. How proteolytic processing regulates the activity of MLL is not known. Intriguingly, the FYRN and FYRC motifs of a second family of histone H3K4 methyltransferases, represented by MLL2 and MLL4 in humans and TRR in Drosophila melanogaster, are closely juxtaposed. FYRN and FYRC motifs are found in association with modules that create or recognise histone modifications in proteins from a wide range of eukaryotes, and it is likely that in these proteins they have a conserved role related to some aspect of chromatin biology [(PUBMED:20506279)]. The FYRN and FYRC regions are not separate independently folded domains, but are components of a distinct protein module, The FYRN and FYRC motifs both form part of a single folded module (the FYR domain), which adopts an alpha+ beta fold consisting of a six-stranded antiparallel beta-sheet followed by four consecutive alpha-helices. The FYRN region corresponds to beta-strands 1-4 and their connecting loops, whereas the FYRC motif maps to beta-strand 5, beta-strand 6 and helices alpha1 to alpha4. Most of the conserved tyrosine and phenylalanine residues, after which these motifs are named are involved in interactions that stabilise the fold. 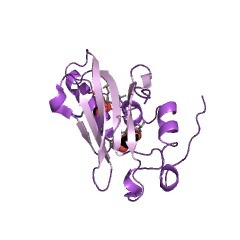 Proteins such as MLL, in which the FYRN and FYRC regions are separated by hundreds of amino acids, are expected to contain FYR domains with a large insertion between two of the strands of the beta-sheet (strands 4 and 5) [(PUBMED:20506279)]. There are 3181 FYRN domains in 3175 proteins in SMART's nrdb database. Taxonomic distribution of proteins containing FYRN domain. This tree includes only several representative species. The complete taxonomic breakdown of all proteins with FYRN domain is also avaliable. Click on the protein counts, or double click on taxonomic names to display all proteins containing FYRN domain in the selected taxonomic class. Evidence of domain swapping within the jumonji family of transcription factors.